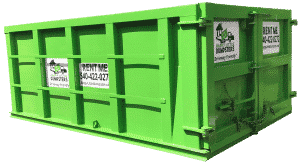 The purpose of this article is to let you know that dumpster rental is an easy, cost-effective option for homeowners and renters. Renting a Happy Little Dumpster is even easier. 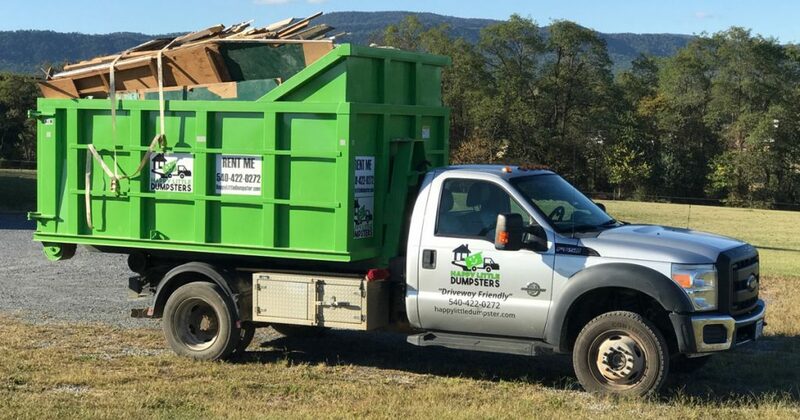 Whether you're cleaning up your yard, cleaning out your garage or moving out of your dorm, we have a dumpster sized, and priced, to fit your needs! You can use the links in the "Table of Contents" to jump directly to any section, or feel free to read from top to bottom. If you have any questions, call us at 540-422-0272 or use our contact form. The first step in the dumpster rental process is determining which size dumpster is best suited to your project. We offer dumpsters in three sizes; 6 yard, 12 yard, and 20 yard. We’ve found that these three sizes suit the needs of the vast majority of DIYers and contractors. Below you’ll find information about each specific size, along with their common uses. Our 6 yard dumpsters are perfect for heavy debris, like plaster, concrete, bricks, blocks, stone, gravel, or asphalt shingles. Aside from indoor projects, a 6 yard dumpster can be a perfect fit for landscape and garden cleanup, as well as small (10x10) deck demolitions. If you’re doing a roofing project with asphalt shingles, a 6 yard dumpster with a 4 ton weight allowance will hold around 20 square worth of shingles. 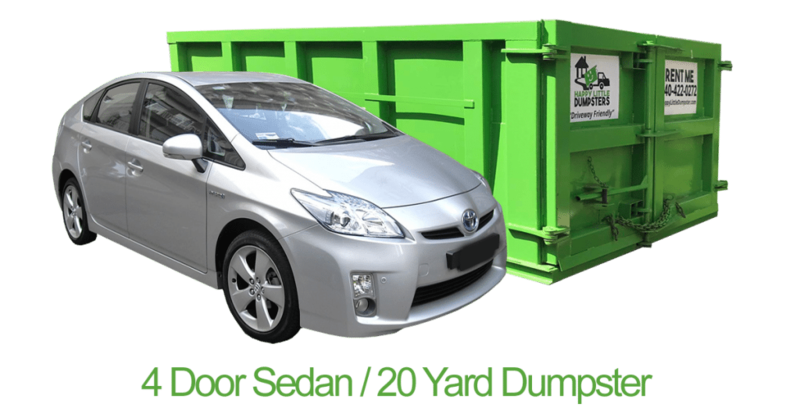 20 yard dumpsters are excellent for large DIY projects and commercial job sites. A 20 yard dumpster can hold a LOT of junk, but still has a small footprint of only 8’ wide by 12’ long. In short, if you have room to put a car somewhere, you have room to put one of our dumpsters there. If you’re still unsure what size dumpster best fits your needs, give us a call and we’ll be happy to help you decide. Most DIY projects around the house can be accomplished with a 12 yard dumpster. What kind of projects? Kitchen remodels, garage or basement cleanouts, and medium (10x18) deck demolitions can usually be contained in a 12 yard dumpster. If you’re tackling a roofing project, a 12 yard dumpster can hold 20 square worth of shingles along with all the paper and debris that goes along with roof replacement. We’re happy to accept most any household & construction waste, as well as landscaping or yard debris. While we love to say yes, we are not a hazardous waste carrier & cannot accept any form of hazardous waste. The lists below show what we regularly accept, as well as items we are unable to accept. If you have questions about what is and isn’t acceptable for disposal in our dumpsters, please give us a call or contact us. You can expect our delivery driver to show up on time, and provide you with excellent customer service. If you’re present for delivery, the driver will show you how to operate the doors on the dumpster and answer any other questions you may have. Your dumpster will be delivered and placed on wooden skids that protect your property surface. The entire delivery process only takes a matter of minutes, and then you’ll be ready to start loading that dumpster. When you’re done with the dumpster, call us and we'll pick it up same day or the next day. You do get three days with no daily rental charge, but we do love getting the dumpster back early so other costumers can use it. The pickup process also extremely fast. Within minutes you’ll be watching a dumpster full of junk drive off into the sunset! In general, it is best to plan ahead for your dumpster rental. Not only does this provide you time to decide what size dumpster you need and how long you’ll need it, it also helps ensure a dumpster will be available. We recommend requesting a dumpster 5 to 7 days prior to your desired delivery date. We do offer same-day dumpster delivery, but that is based on dumpster availability. We recommend requesting a dumpster 5 to 7 days prior to delivery to ensure the size dumpster you need is available. Staging your items ahead of time may save you both time and money. If you’re able to stage your items close to your desired dumpster location, you may be able to limit the number of rental days needed down to only 1 day. Staging your items ahead of time will also allow you to take your time and reduce your workload once the dumpster is delivered. Staging your items will reduce the need to travel to and from the dumpster once it is delivered. In preparation for delivery, make sure the path to your desired drop-off location is clear of any obstacles such as vehicles, bicycles, lawn furniture, trash, or toys.. The delivery truck will also need approximately 12 feet of vertical clearance when dropping off and picking up the dumpster. If you will not be present when the dumpster is delivered, please describe and mark the desired drop-off location. Note: Please make sure underground utilities such as septic tanks, or drains are not in the path of the delivery vehicle. The vehicle will weigh over 16,000lbs when leaving with a full dumpster, and could potentially crush underground utilities. 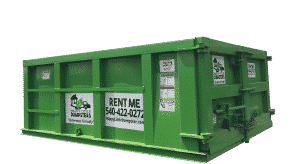 You can get an instant, flat-rate, quote by visiting our Dumpster Rental Prices page. 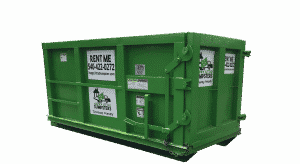 For residential customers, flat-rate dumpster rental pricing makes the most sense. Flat-rate prices provide an all-inclusive price based on the dumpster size, the number of days the dumpster is being rented for, and the maximum allowable weight of the dumpster contents. With flat-rate pricing you know exactly what you’re getting and exactly what you’re paying. No surprises. What if I Keep the Dumpster Longer, or am Overweight? In our experience, asphalt shingles and concrete are the items most likely to cause overages due to their weight. Asphalt shingles don’t take up a lot of space, but are very heavy relative to their size. Check out our article How To: Estimate Material Weight Like a Pro for more information on estimating the weight of your refuse. If you are still unsure about weight, give us a call! We’ll be glad to help! Make sure the company you talk to is actually a local company, not a broker. Working directly with a local company will save you money, and ensure you have direct contact with the company providing the service. Making sure a clean dumpster arrives at your location is important. A smelly, dirty dumpster isn’t just a nuisance, it can also be a breeding ground for bacteria. Make sure the dumpster rental company you select provides clean dumpsters. A little dust and dirt on the outside is normal, but don’t accept a dumpster that shows up smelling or looking like the landfill. Nobody wants a full dumpster taking up space on their property or jobsite. Make sure the company you rent a dumpster from will pick up your full dumpster the day you call for pick up. A lot of companies will wait several days before pick up. Happy Little Dumpsters, LLC will happily pick up your dumpster as soon as you’re ready, regardless of your rental duration. Simply call us, and we’ll haul it away the same day. As stated earlier, flat-rate pricing makes sense for residential rentals. You know up-front exactly how much you’re spending, and exactly what you get for that price. Look for a company that provides flat-rate or all-inclusive pricing. This pricing structure should include the dumpster rental for a set number of days, landfill fees up to a certain weight, and all applicable taxes. Verify with the company that there are NO hidden fees. Any service company should be focused on providing an excellent customer experience. Look for a company that goes out of their way to accommodate your needs. Additionally, it’s a good sign when a company responds quickly to your emails, texts, or calls. Companies that readily make themselves available to you, or offer extended business hours, are focused on providing you with a quality service and experience. If you have any questions at all about how dumpster rental can help you accomplish your projects, we'd love to hear from you. Give us a call, leave a comment below, or fill out our contact form. If you found this information useful please share it with your friends on social media! GET AN INSTANT QUOTE. NO PERSONAL INFO NEEDED. I need to get the right dumpster so I can dispose of all of my junk. It makes sense that I would want to be sure that I get one that’s the right size! That way I don’t have to worry about not being able to fit everything inside. You’re absolutely right Braden! Not only is the overall size of the dumpster important, it’s a good idea to make sure the weight limitations of the dumpster meet your needs as well. Thanks for your comment! I really like the idea behind getting a “clean” dumpster. I really wouldn’t want a dumpster that smelled like some of those restaurant dumpsters I’ve smelled. Good work with this blog, and a good read! Delivering clean and well maintained dumpsters is something we’re pretty passionate about John. We definitely know the stench you’re talking about, and we work hard to make sure our customers never catch a whiff of that coming from any of our dumpsters! Thanks so much for you comments, and I’m glad you enjoyed it! I agree that size matters when choosing a roll off dumpster. Finding out how much stuff you have to haul away would help you know what size to get. You may also want to talk with past clients to see how reliable a rental company is. This is a fantastic guide you’ve put together here and I especially like that you included a section on what can and cannot be thrown away. After all, when someone rents a dumpster they need to have a thorough understanding of any limits on what they can throw in there. That way they do not get suddenly charged as a penalty for something they did not know about. It is actually a great and useful piece of info. I’m happy that you just shared this helpful information with us. We’re glad to see folks reading this! We hope it helps people with renting dumpsters who aren’t familiar.